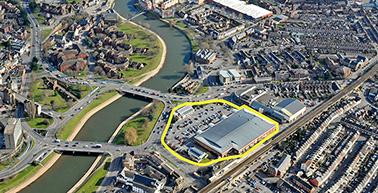 Prime retail park close to the heart of Exeter city centre. The investment has been sold to Possfund. CPG have retained redevelopment rights over the former library site. Exeter is the regional capital of Devon with an estimated population of 482,000.
fronting the main road route into the City from the South. A terrace of four retail warehouse units with a stand alone restaurant and a public library. The scheme has a GIA of 61,000 sq. ft. with 248 customer car parking spaces. Reconfiguration of site access and car park. Refurbishment and re-letting of the former JJB Unit to Marks and Spencer. Redevelopment of the on site library to provide new retail units.